would not a compression test be first? throttle held open. 8v of 16v? ouch this makes this so hard, !!!!! radical different EFI on the 2 and sensors and harnesses unique. I means spinning the crank shaft fast. only. 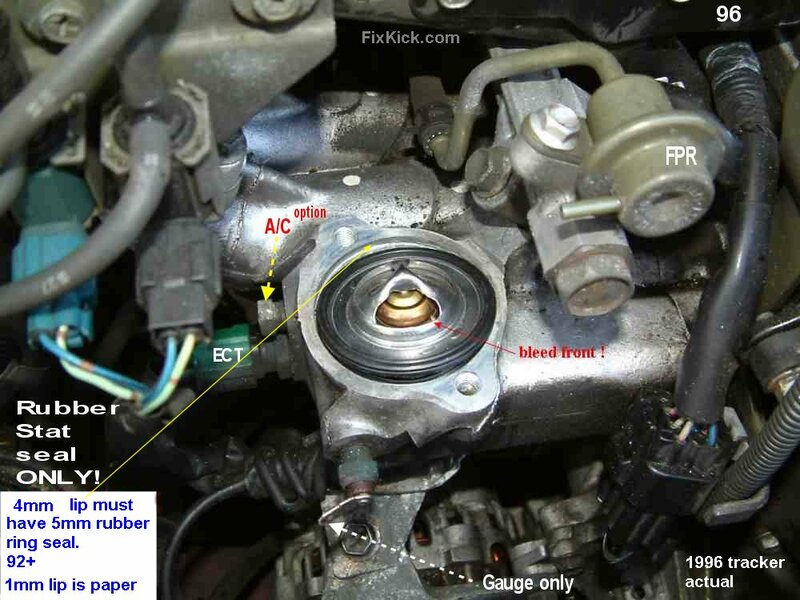 starting is whole other EFI function. fails on test fuel, spark good is bad engine, or timed wrong. 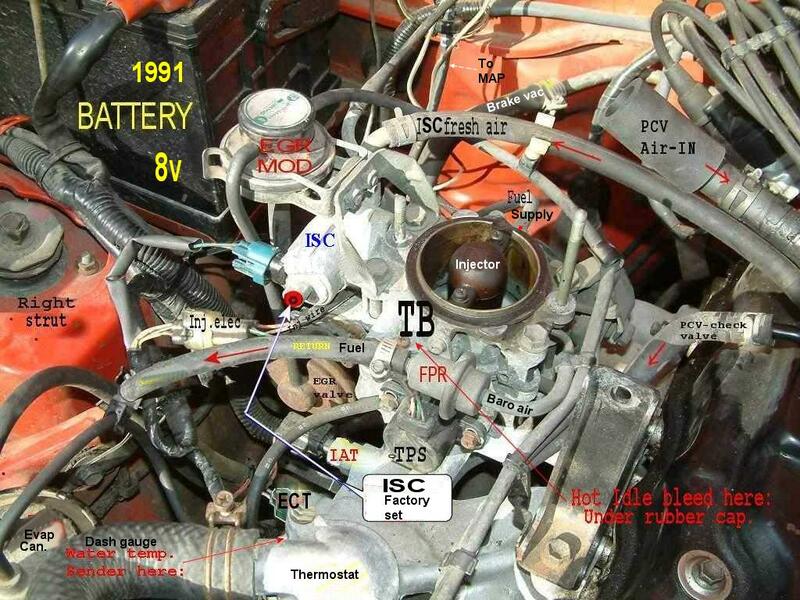 fuel to TB, but what does the injector do, on 8v can be viewed, if 16v can be. so use test fuel on 16v sure which you would post engine valve count. I have had the head reworked on my 92 tracker. Engine was steaming but no water in oil. Head was pressure tested and milled. After putting it all back together, it ran good but was still steaming. Water in the oil this time. I didn’t check the block very well. It had some low spots that I was able to hone out by hand using a grinding stone. Put it back together the second time with another new gasket and can’t get it started. I was careful to check timing marks and took note of valves on 1 and 4 at tdc. I have fuel to the throttle body and have spark. I did, however have a wire left that I didn’t remember taking off either time. Suzuki has many connectors not used, 50 options and only 10 harnesses not 50 harness so missing options are NORMAL. Cruise, AC/. 4door with rear wiper pump option missing. I was looking at some of the pictures on your website and found what I think is the same wires on slide 5 of the intake manifold slideshow. The white connector and wires on the lower left of the frame at the firewall. drivers left or facing engine left? I can’t find a wire or socket to plug it into. These wires come out of the main harness to the back and just below the intake manifold. back later with me decode colors. on 2 schematics. 8v and 16v. if only you had said injector or injectors, id be on track. The , red-yellow is ECT wire. and is pair. not 1 wire. again no valve count stated. the 8v ect is on usa passenger side called RIGHT side, and is just behind the 1 pin dash temp sensor gauge sensor. and next to IAT sensor seen on my 8v pages. THe 16v ECT is on the thermostat housing. Thanks for your replies. It is an 8 valve engine with tbi. The wires (2) I was talking about go into a white connector. One is yellow with a purple dot, the other is red with a blue band. The wires I was talking about in your picture was at the firewall near the battery. The picture was in the intake manifold slideshow on your website. The battery is weak and on charge now. The engine will crank but not start. I have not put a timing light on it, but number 1 piston is tdc with the valves closed and rotor button pointing to #1. I am going to try again with a little gas in the throttle body.